Michelle Ye (葉璇) is in love and she’s not afraid to show it. After going public with fashion stylist boyfriend “Mr. Little Mo,” the 35-year-old actress has been frequently spotted on dates with her 36-year-old beau, unfazed by the paparazzi’s fascination of their relationship. Michelle and Mr. Little Mo frequently attend public events together. Last month, the couple went to watch a spectacular ice show in Shanghai. A few days ago, the pair came to Hong Kong to watch Hacken Lee (李克勤) and Joey Yung’s (容祖兒) concert held in the Hong Kong Coliseum. 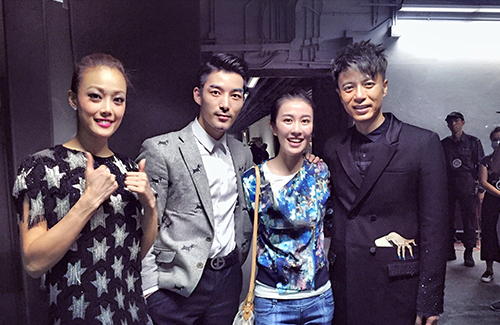 Michelle is acquainted with Hacken, as the two collaborated in Michelle’s first TVB drama, Street Fighters <廟街·媽·兄弟>. The couple are now back in Mainland China, but prior to leaving Hong Kong, Michelle and Mr. Little Mo managed to do a few of hours of souvenir shopping together in Causeway Bay. Seeing Michelle and Mr. Little Mo being affectionate with each other comes at no surprise, as the couple frequently make headlines in China for their public displays of affection. Hong Kong turns out to be no exception—during their shopping spree in Causeway Bay, Michelle was seen kissing Mr. Little Mo’s cheek more than just a few times. Mr. Little Mo squeezed Michelle’s thighs and had his arms wrapped around her waist. That evening, the couple met up with a female friend and went to a restaurant owned by Eric Tsang (曾志偉) for dinner. An hour later, Michelle bid her friend farewell and continued shopping for a few more hours before taking the MTR to the airport. A few passengers on the train recognized Michelle, which prompted Michelle to keep a respectable distance from Little Mr. Mo.